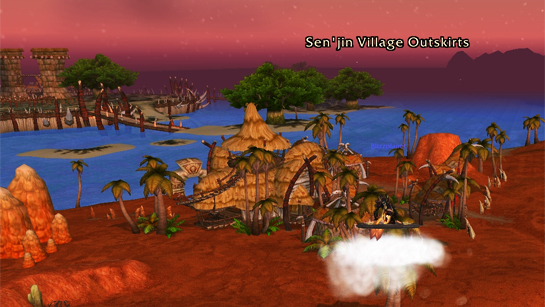 Ki’ta Arrowtusk: Welcome ta Sen’jin Village, mon. I know you traveled far ta see Vol’jin, leader a’ da Darkspear. But I must ask ya ta wait a little longer. Let us speak. Ki’ta Arrowtusk: Walk wit’ me, (class). Vol’jin be seein’ ya in just a moment. 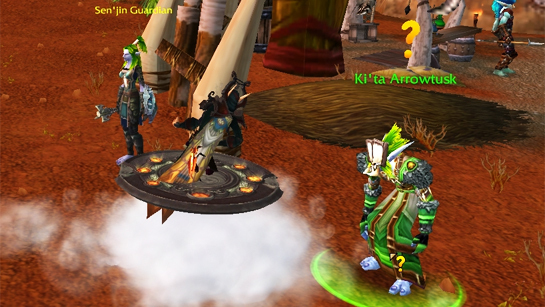 De “Warchief” still believes Vol’jin be dead, slain by his Kor’kron assassin in Kun-Lai Summit. 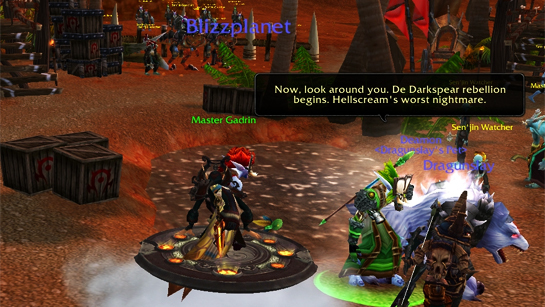 Vol’jin survived, but he still remember da sting a’ Hellscream’s betrayal. Darkspear never die. When Vol’jin come back ta us, I saw he was changed. Da light a’ revolution be burnin’ in his eyes! Now, look around you. De Darkspear rebellion begins. Hellscream’s worst nightmare. De spark becomes a flame, de flame becomes a fire, de fire … an inferno. We gonna burn our way ta da gates a’ Orgrimmar. But we gotta feed dis war machine. Stone, wood, oil, meat – we be needin’ ’em in large supply. Dat’s where we need ya, (brodah / sistah). Go, speak to Vol’jin. Prepare yourself. From here on out, we be askin’ more of you den ever before. 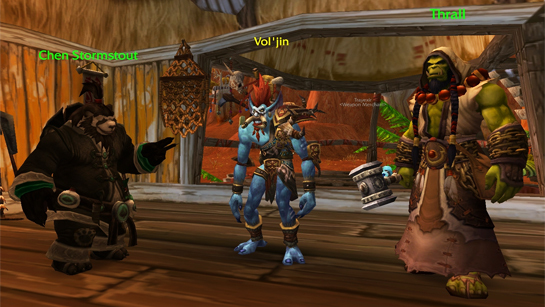 Vol’jin: Look at us three. Back to da sands of old Durotar! It be just like old times. Thrall: Not quite, old friend. Times have changed. The line between friend and foe is not so clear. You: What happened to you in Pandaria? Vol’jin: It been a long road, friend. Garrosh tried ta take me life wit’ a knife in de throat. Left me for dead. I crawl out dat cave, couldn’t even speak. It was Chen Stormstout who found me, nursed me back from de brink. I made up me mind. I’m takin’ de Horde back. No matter de cost. You: Does Garrosh know you’re alive? Vol’jin: Not yet he don’t. Maybe he hearin’ rumors. Maybe he thinkin’, dey ghost stories. Maybe ol’ Vol’jin comin’ back ta haunt him. Hah. He find out soon enough. 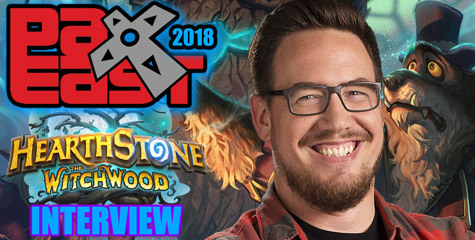 Too bad I’m not gonna be there ta see da look on his fat, beady-eyed face when he hears ol’ Vol’jin is back, an’ gonna make good on me promise. Ta end his sad little reign. Ta fire de arrow dat pierces his black heart. You: Why are you fighting against our own Warchief? Vol’jin: Ya still call him “Warchief,” (class)? Is he still YOUR Warchief? What of de spoils of his war? I don’t see you fat an’ happy like his Kor’kron. His Horde be an orc Horde. Do ya still feel welcome here, (race)? Are ya a part of his plan? Or are ya trash he gonna do away wit’ once he has his way? He promise glory, but bathes our Horde in blood, an’ steps on anyone who see it diff’rent. Ya wanna know how I see de Horde? De Horde dat me an’ Thrall built? 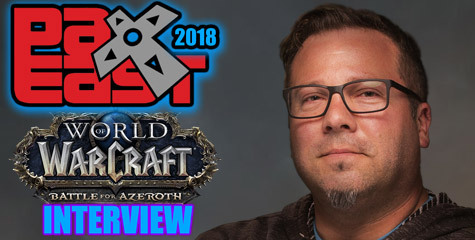 You: How do you see the Horde? 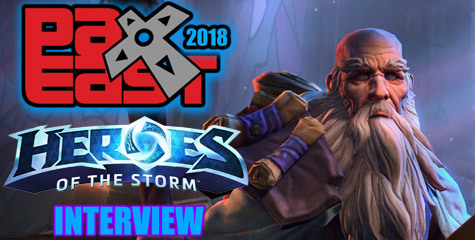 Vol’jin: Horde be a family. When de whole world try ta put us down, de family come an’ pick us back up. We all each other got, see? Hellscream, he don’t see family. Ain’t never had one. All he see is power, like he just come through the portal. We stand against him – together, here, now – or he stome us out. One. By. One. I got de scars ta prove it. Who do ya trust, (name)? Where be your loyalty now? Hellscream? Or family? Vol’jin: (Class). Looks like ya just chose a side. I hope ya ready ta fight.